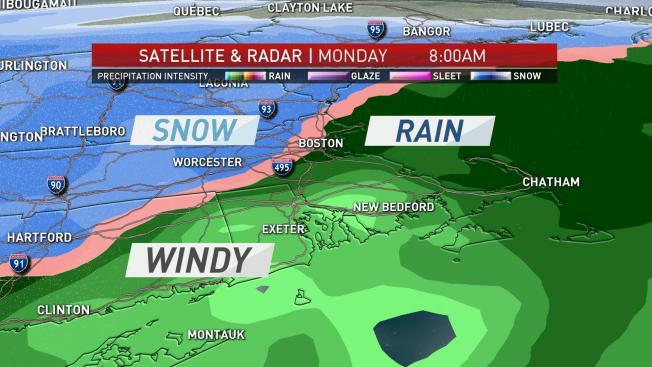 For New England, even if this Christmas isn't a white one, it's certainly going to be wet. Today (Christmas Day): Snow and rain ends by midday as a burst of snow for many, then windy. Temperatures in the 20s & 30s. West wind gusts to 50 mph. Monday Night: Clearing, cold wind. Lows around 20. Tuesday: Fair and cold. Highs in the 20s. A high impact winter storm will give way to moderate impact wind and sunshine for our Christmas Day. One low pressure system in New York State is weakening as another low pressure system near Cape Cod deepens rapidly. This is quite a moving target of a weather system today. The rain/snow line is the trickiest part. Where it is snowing we can see 5 to 10 inches, and where it's raining we may see it end as snow with a flash freeze. There could be a gradient of no snow to 5 inches of snow within about 20 miles somewhere near Boston. For most of us the snow is done by noon time, however in the state of Maine it will remain snowy and windy through much of the afternoon. A Blizzard Warning is in effect through 5 p.m. for parts of Maine and southern New Hampshire. It's hard to believe that the record for snowiest Christmas Day is from 2002, with only 3.3 inches in Boston, 8.5 inches at Blue Hill in eastern Massachusetts, and 27 inches in Woodstock, Vermont. The records at Woodstock and Blue Hill seem to be safe. However, Boston could get 3.5 inches of snow making this the snowiest Christmas day on record -- it's going to be close. For most of us it looks like about a 5 inch snowfall, but there could be an hour or two in there where there is thunder and it snows 2 inches in less than an hour from west to east this morning. The most dangerous part of the storm could be where we have rain that changes to snow with the temperature drop of 10°, right near the rain/snow line that may be a flash freeze with instant icing of sidewalks and side roads. In addition to snow advisories, we also have wind advisories in effect today. After the snow ends, wind from the west may gust past 45 mph, causing blowing and drifting snow and possibly white out conditions even after the snow stops. Scattered power outages are also possible. Today (Christmas Day): Snow and rain ends by midday as a burst of snow for many, then windy. Temperatures in the 20s & 30s. West wind gusts to 50 mph. Monday Night: Clearing, cold wind. Lows around 20. Tuesday: Fair and cold. Highs in the 20s. But travel weather does improve dramatically this afternoon for most of us. The story for the rest of the week is mostly dry, and frigid temperatures. 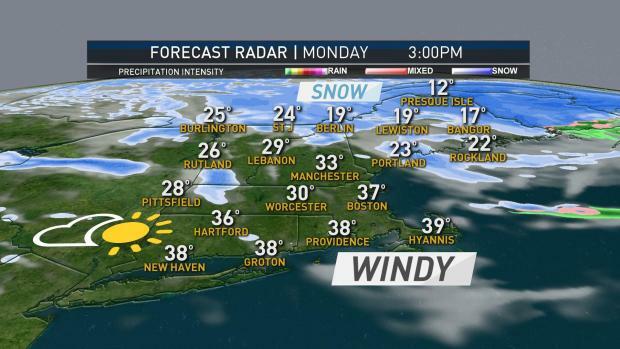 Maybe a few snow showers, Tuesday will be in the 20s. The rest of the week it looks like high temperatures in the teens, single numbers in the north. We likely have a sub-zero morning in many spots for Thursday and/or Friday. There will be another storm approaching from the south Friday with a chance of more snow near the coast. There's also the potential of another storm getting close on New Year's Eve. The one thing we are most confident of - it is going to be a harsh chill to close out 2017. Merry Christmas from the NECN & NBC Boston weather team.